Answers to these and other questions were provided by IOM, the UN Migration Agency and the United Nations Children’s Fund (UNICEF) when they published this week (02/10), results of a new survey completed by IOM’s Displacement Tracking Matrix (DMT) unit focusing on children and adolescents. The survey, which was financially supported by the Central Emergency Response Fund (CERF) and the US Department of State’s Bureau of Population, Refugees, and Migration (PRM), was conducted in the municipalities of Pacaraima and Boa Vista, in Roraima state in May and June 2018. IOM and UNICEF identified the challenges faced by Venezuelans upon arrival in Brazil, especially by children and adolescents. Almost 4,000 people were interviewed, 425 of whom were with their children under the age of 18. Data of approximately 726 children and adolescents was also collected. The majority of the interviews were conducted in the neighbourhoods of Boa Vista and Pacaraima (426), 171 were on the border between Pacaraima and Venezuela, and 76 were in the bus station of Boa Vista. 63.5 per cent of the children and adolescents do not attend school. Considering only compulsory school age, more than half (59 per cent) of the children and adolescents aged 5-17 years in the neighbourhoods do not attend school. In the age group of 15-17 years, 76 per cent are out of school. Most children and adolescents (87.1 per cent) were up-to-date on their vaccines. Among the general population interviewed, 70 per cent reported having had access to health services. Nonetheless, poor sanitary conditions can impact their health; Some 60 per cent of the survey respondents reported having no access to filtered drinking water; 45 per cent lacked regular access to water for cooking and for personal hygiene. 28 per cent of the people under the age of 18 had diarrhea in the past month. Since arriving in Brazil, 115 children and adolescents (16 per cent) experienced a period during which they did not have enough food. 128 had to reduce the number of meals. 93 felt hungry and were not able to eat. 84 ate only once or did not eat for some days. 16 of the respondents indicated that, at some point after arriving in Brazil, a child or adolescent under their responsibility had worked or performed some activity in exchange for payment. See the complete survey in Spanish and Portuguese. Displacement Tracking Matrix (DTM) is a tool that captures and monitors information on human mobility and displacement. One of its methods are the Flow Monitoring Surveys (FMS). 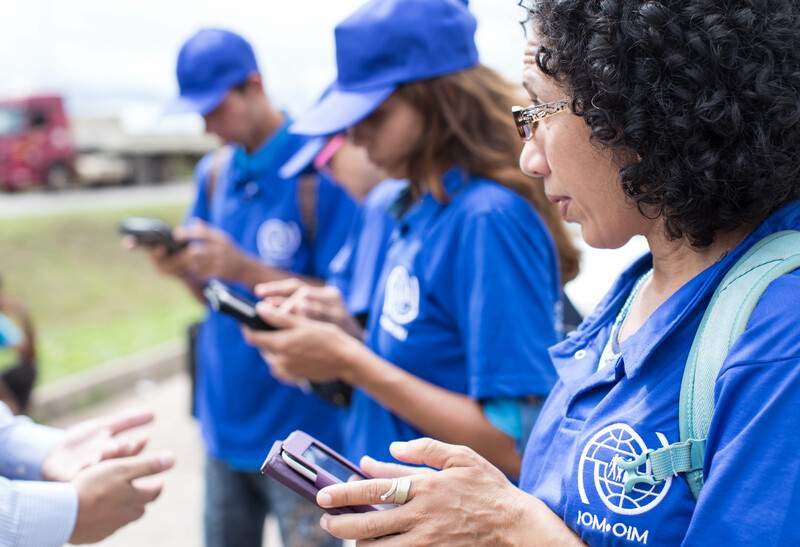 The first round of the survey, which focused on the situation of Venezuelan immigrants in Brazil, was carried out between January and March 2018 by IOM upon the request of the Brazilian Ministry of Human Rights. The second round, conducted between May and June and supported by UNICEF, focused on children and adolescents. The first survey was carried out in transit sites and settlements in Boa Vista and Pacaraima. Homeless people and people living in abandoned properties and houses were interviewed. The team interviewed 3,785 people – a majority of them over 18 years old. Additionally, 27 unaccompanied minors (over 15 years old) also were interviewed. The results only reveal the characteristics of the population surveyed. Therefore, it is not possible to make a probabilistic generalization of the entire Venezuelan migrant population either present or in transit between May and June 2018 in Boa Vista and Pacaraima.